Physics is one of those remarkably successful branches of science that have helped shape the modern era. Let your gaze drop on any man made gadget in your surroundings and its likely that its working principles go back to a fundamental discovery in physical science that dates back no more than two hundred years or so. It is the beauty of the scientific method that when theory is in conflict with empirical facts, it creates a powerful drive to reconcile the two by carefully revisiting every measurement, assumption and calculation. In this instance as well, cherished theoretical assumptions about how the world works were abandoned, and the beautiful and bizarre theory of quantum mechanics was pieced together. One of the most important achievements of this discovery process was to explain the observed stability of matter on the basis of the behavior of elementary particles such as the electron and the proton. It is this underlying design pattern for stability that might be worth abstracting and discussing in the context of economics. So why is the world stable? Briefly, stability at the microscopic level works as follows: The picture included in the post shows the likelihood to find an electron around the atomic nucleus (composed of protons and neutrons) for different excitation states of the hydrogen atom. The more excited the electron (the more energy it has) the more complicated the pattern it traces around the nucleus. Vice versa, when the electron loses energy, it transitions to a simpler state. At the lowest energy, the electron occupies the simplest state, a spherical configuration around the center, as depicted in the panel (2,0,0). In that state there is nothing simpler / of lower energy to transition to… Hence the electron simply stays there. The only allowed path away from that ground state is towards more energy, towards more complication, towards more fragility (all the other panels in the picture). 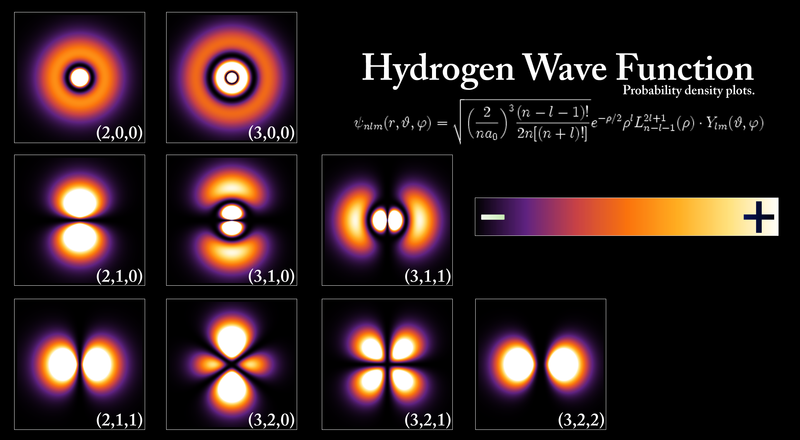 If at a later stage the energy that prompted the transition to the more complicated state dissipates, the electron just relaxes back to its base state. Now for the trillion dollar question: Can this design pattern for stability be associated with anything meaningful regarding financial system stability? That criticism is eminently fair. Reducing economics to something resembling physics is a very difficult, if not futile, enterprise. To start with, economic phenomena have an obvious very strong evolutionary, “historical”, aspect (that is, economic behavior is changing in relatively short timescales). Now, so-called path dependent, non-equilibrium physical processes are common in physics but they are amongst the most difficult to construct mathematical theories for. There is also a “political” (self-referential) aspect in economics. The analysis and understanding of economic phenomena is used to justify or aim to change the phenomena themselves. Such complicated feedback loops are largely absent in physics (although one of the other remarkable aspects of the quantum world is that the observer always disturbs the system she tries to measure). Alas, avoiding the excesses of mathematical over-quantification was not a terribly successful research program either. It turns out that, a good forty years after Hayek, the state-of-the-art macroeconomic models, arguably the most complete theoretical representations of “the economy”, did not even include banking as a relevant phenomenon. It is thus of no surprise that no serious prediction of the financial crisis was at hand, nor of the subsequent serious impact on economic activity. The lack of an adequate mathematical framework to conceptualize economic activity does not mean there cannot be fruitful qualitative analogies. The analogy we are seeking is the broad shape and characteristics of a stable ground economic state. What is the ground state for animal spirits? Even apart from the instability due to speculation, there is the instability due to the characteristic of human nature that a large proportion of our positive activities depend on spontaneous optimism rather than mathematical expectations, whether moral or hedonistic or economic. Yet what is being referred to in this quote, the optimism and “positive activities” belong clearly to the “excited” states of the economic system. Those are the time periods where the collective is self-confident and pursues growth and change projects. The quest for financial stability does not mean that such states will be eliminated or that they can somehow be guaranteed of success. When thinking about fundamental stability, the focus is to instead to try to find how economic interactions look (or should look) when there is barely any appetite for risk taking. In such a “low animal spirits” environment economic stability requires that several basic activities continue without hindrance. This includes, for example, continuing ability to exchange payments between individuals and firms. Hence separating this particular service provision from any dependency on “animal spirits” would seem like a basic requirement for financial and economic stability. Yet another major requirement concerns the safety of “deposits”. This is essentially the financial technology by which we achieve that work performed here-and-now can be safely time-banked in order to be received as equal work sometime in the future. For example if you babysit somebody else’s offspring today, you should reasonably be able to receive that (or an equivalent) service possibly decades into the future. This fundamental time-banking function is performed by banks of various shapes and forms. Now, there is no physical law that can guarantee you a reciprocating babysitting session two decades from now. The world may have blown itself to pieces, dissolved into anarchy or otherwise reneged on using rule of law as an organizing principle. The best that can be achieved is to discuss financial stability conditional on the continuity of the legal frameworks and social contracts espoused by the collective. Yet, remarkably, the current banking infrastructure is actually far from enabling stable “quid-pro-quo” exchanges across time. We leave aside in this post the fact that current monetary systems are prone to inflation, as this is a long-term pathology rather than a short term destabilizing feature. We focus instead on the instability induced by the intermingling of the basic time-banking function (the bank deposit taking activity) with other speculative investments (the bank lending activity). In speculative investments people agree to risk their earned babysitting session in exchange for two or more sessions in the future. While this should be an optional activity, it is currently not. The possibility of widespread panic arises because people worry about time-banked earnings they never wanted to put at risk in the first place. On the face of it, there are some economic benefits from the forced commingling of deposits with investments (and not just for the bankers!). This is the fundamental concept of leverage. It helps accelerate growth oriented projects by providing only partial coverage by pledged deposits. In physical terms, the system is prodded using leverage to be at a higher “energy level”. Yet the stability of this more complex leveraged configuration hinges on regulation. Regulation aims to maintain a low likelihood that too many of the investment projects fail at the same time, thus threatening the deposit base. Historically we see that regulatory failure is a recurring pattern. The outcome is a chaotic and costly transition to the true ground state. This ground state is essentially the guarantees provided by the collective (government). This begs the question: why isn’t the ground state available before a crisis? A stable ground state corresponds to the ability of savers to have any desired fraction of their savings directly or indirectly parked with a central bank type entity. Commentators from across time, geography and politics have argued for the benefits of this narrow banking, sovereign money and other variations of this theme but it is still a financial technology that remains unexplored and not understood. For example it does not imply there will be no risky deposits. But while there would be still runs on risky investments / deposits (and need for regulation to control their frequency and amplitude) this would concern only a subset of savings, those that truly want to be “at a higher energy level”. Correspondingly, any loss of leverage on safe deposits might be compensated by increased leverage on risky deposits. A whole century after we understood the true reasons for the physical world’s stability, ushering an era of true financial stability would seem like a perfect chance for theoretical economists and practical “fintech” initiatives to redeem their reputation!